Separating emulsified oil from water, two immiscible (non-blendable) liquids, can have a range of different applications. In the case of an environmental disaster, such as a coastal oil spill, efficient, fast removal of the oil component from the water-oil emulsion is critical in the clean-up and recovery of the surrounding area. Another example involves sewer systems that use special cleaning fluids to wash out the process equipment. Removing oil contaminants from cleaning fluids enables to cut back on the amount of fluid used, which cuts costs and decreases the impact on the environment. Mechanical separation, including gravity separation and coalescence, is used is each case. Use gravity to separate your oil and water emulsion. Centrifuge the two substances together. The heavier liquid will reach the bottom first and stay there, while the lighter of the two will remain in a layer on the top. High G-forces are required. Vacuum the oil dry to reduce the partial pressure. Reducing the pressure of a liquid means that the liquid boils sooner than it would at normal pressure. Because water boils at a lower pressure than oil, it begins boiling earlier than oil, so more readily evaporates and can therefore be removed at an earlier stage. Chemically treat the emulsified oil and water mixture. Destabilize the two components by adding either a salt or a polymer plus acid. The salt acts on the emulsified oil in much the same way as bile salt breaks down fatty substances we ingest, by bonding to its outer coat and breaking it up. Allow the oil and water to naturally draw apart over a period of a few hours. Use a skimmer to lift the oil layer off the surface of the water. Treat waste water which contains smaller droplets of emulsified oil using flotation, an adsorptive bubble separation technique. 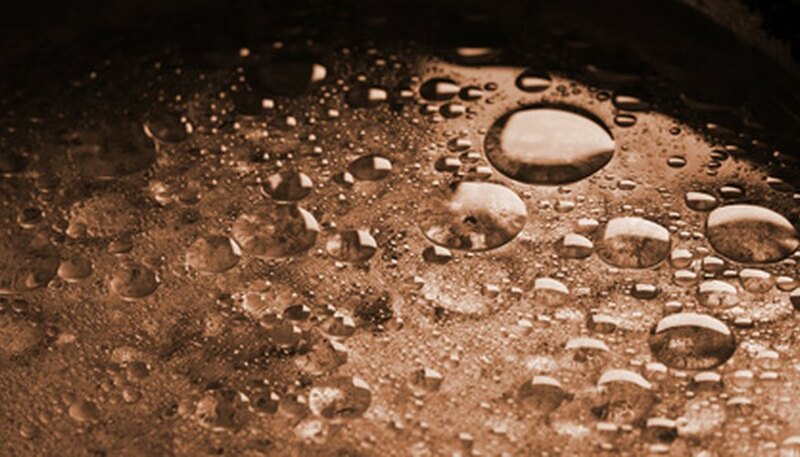 During the process, fine air bubbles are injected across the surface of the oily emulsion. The oil agglomerates, or sticks, to the air bubbles in the added presence of a surfactant (a chemical which enhances the adherence of the two components, air and oil). The air and oil create a foam-like layer on the surface of the increasingly clean water. The foam is then skimmed from the surface using a large, mechanical skimmer. Flotation can separate water from emulsified cutting oil, machine lubricant and white spirit. Separate old oil from water with more forceful procedures, such as high centrifugal separation hydrocyclone technology (Ultraspin uses forces of more than 1,000 times that of natural gravity). Old oil is oxidized to a greater extent than new or “fresh” oil, and therefore has what are known as “hooks,” which can more readily attach themselves to water molecules. Old oil emulsifies in larger amounts of water, so more powerful methods are required to get the water out. Decide if water is on your side or not. This depends on the types of processes you are attempting to carry out. If you want to clean waste water and make it usable again, you need to prioritize the water element of your mixture. If water works against the process you deal with, and attracts other contaminants, such as oxide insolubles or micro-organisms, prioritize the oil component of the emulsion. Ensure the chemicals you use comply with international standards of safety and environmental care. Parks, Natasha. "How to Separate Emulsified Oil & Water." Sciencing, https://sciencing.com/separate-emulsified-oil-water-7640757.html. 25 April 2017. How Does an Oil Well Work? What Kind of Oil for a Rock Saw?